Ranelagh Evening Dresses. The Gallery of Fashion. Home » Ranelagh Evening Dresses. The Gallery of Fashion. 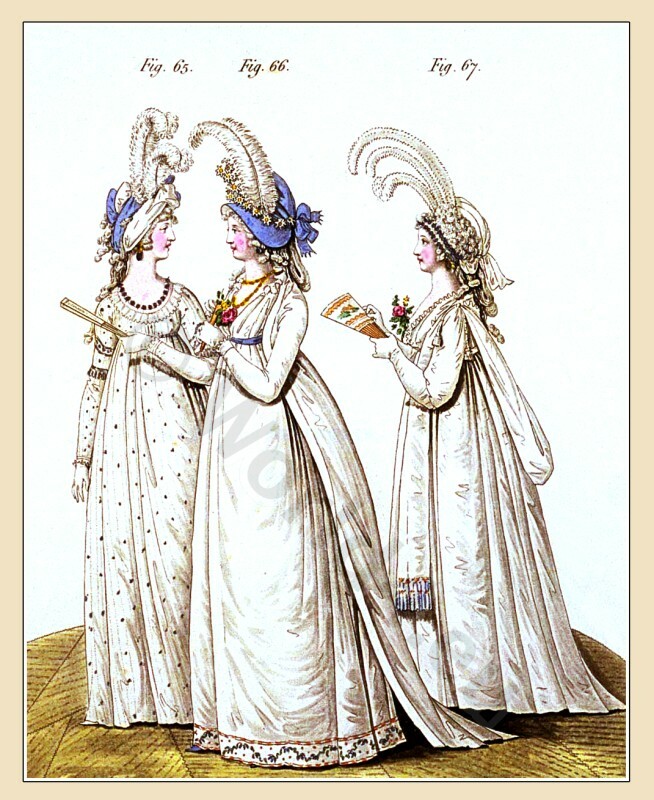 Ranelagh Evening Dresses, August 1795. The Gallery of Fashion Vol. 2. Published by Nikolaus von Heideloff, London. Georgian fashion era. Neoclassical costume in the time of Jane Austen. The hair in small curls, and the hind hair in ringlets. Bandeau of fine dear muslin and lilac-coloured silver tissue, intermixed with the hair. Two white ostrich feathers placed in the front. Brunswick chemise of striped muslin, spotted with silver, the body plaited behind and drawn in the front; trimmed round the neck with a full plaiting of lace; long sleeves trimmed at the wrists with lace; short sleeves over them, trimmed with silver fringe. Sash of narrow white riband. Pearl necklace and ear-rings. White shoes spotted with silver. White gloves. The hair in curls, the hind hair turned up plain. Bonnet of lilac taffeta, trimmed with a wreath of flowers and lilac riband forming a large bow behind; a white feather spotted with lilac on the left side. Robe and petticoat of India long cloth; the bottom of the petticoat embroidered in colours, and the robe trimmed, round the neck and down the sides to the bottom, with a broad white satin riband; long sleeves cuffed at the wrists. Sash of lilac-coloured satin, tied on the right into a small bow. Small handkerchief within. Gold necklace and ear-rings. White gloves. Lilac-coloured shoes. The hair in very small curls; the side hair in larger ones; the hind hair turned up in a double chignon, and the under part hanging down in ringlets. Bandeau of white taffeta, terminating in a short end behind, and intermixed with the curls. Three white ostrich feathers on the left side near the front. Two rows of beads round the head dress. Robe of fine muslin, with short full sleeves, and a plaiting round the neck. Drapery of white silk fastened on the shoulder with a loop and tassels, the ends, hanging down over the shoulder in the front, trimmed with a fringed embroidery. White gloves. Rose-coloured shoes. The Gallery of Fashion Vol. 1,. April 1794 to March 1795. The Gallery of Fashion Vol. 2. April 1795 To March 1796. The Gallery of Fashion Vol. 3,. April 1796 To March 1797. The use of Corsets in the reign of Louis XVI., Revolutionary Period, George III. Nymphs and Merveilleuses. Fashions – Manners – Usages, by Octave Uzanne. Fashion in the Reign of Philippe. 1830 to 1848. Empire, Victorian era. This entry was posted in 1795, 18th Century, England, Gallery of Fashion, Regency period and tagged England Georgian Era Fashion, Neoclassical dresses, Nikolaus von Heideloff, Regency period on 6/12/13 by world4.